The ancient port town of Mammallapuram is a charming hub which has been attracting travellers for centuries. It was known already in Marco Polo’s day as the “Seven Pagodas” alluding to the seven tiered towers that once stood on the shore, of which one – the Shore Temple, still stands. The port is famous for its stone carvings, which have World Heritage Site status. Impressive cave temples, monolithic rathas (chariots) and sculpted reliefs built by the Pallavas in the 7th and 8th centuries form this group of monuments. After sightseeing, enjoy an Indian thali meal or chai tea at one of the bustling diners in town. Upon arrival at Chennai airport, you’ll be met by TLC World Representative and once out of the airport, where a comfortable AC Vehicle awaits, welcomed with traditional Rose Garlands, followed by transfer to Mahabalipuram. In the vehicle, you‘ll be offered cold towels and water with which to freshen up. On arrival at the hotel, you’ll once again be welcomed traditionally with Arti and Tikka (a Hindu Ritual where a young woman puts vermillion on your forehead, welcoming you with a platter of auspicious items). You’ll then drive to Kanchipuram. Kanchipuram is very famous for its Silk Sarees. This is one of the seven sacred cities of India. Its temples are spectacular and the gopums can be seen from miles away. Temples to visit include Varadaraja Perumal Temple, Kailasanatha temple and Ekambareshwara temple. After the visit, return to Mahabalipuram. Overnight at the hotel. 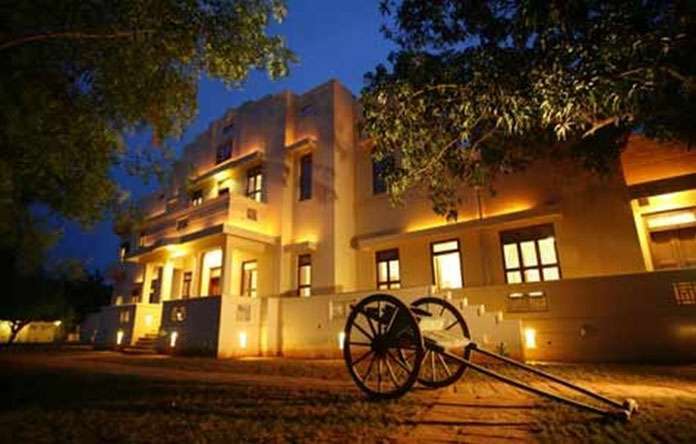 Puducherry – previously known as Pondicherry – is made up of four entirely separate enclaves along the Indian coast, all of which were colonised by the French in the 18th century. Named after the largest of these enclaves, this union territory has retained a strong European culture that makes it unlike any other place in India. Nowhere is this more evident than in Puducherry district, dubbed the ‘French Riviera of the East’, where antiquated colonial buildings line the quiet cobbled streets and tree-lined avenues of the old town, and many people still speak French as their first language. After breakfast, drive to Pondicherry. Pondicherry was acquired by the French in 1674 and features colonial buildings, churches, temples, and statues. The systematic well planned French style avenues are preserved and give a colonial ambiance. En-route visit Auroville. Founded in 1968 by Mirra Alfassa, also known as ‘The Mother’, Auroville is an experimental township where people of different nationalities, cultures and beliefs live together in harmony. 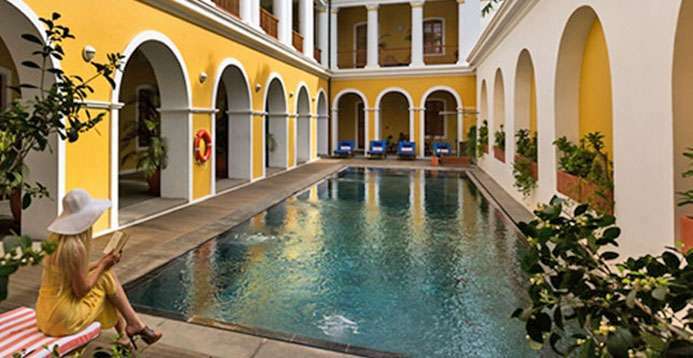 Pondicherry has a number of well-preserved heritage buildings and monuments. You will visit Sri Aurobindo Ashram. The ashram grew out of a small community of disciples who had gathered around Sri Aurobindo. Also visit The Lord Ganesha Sri Manakula Vinayagar (temple) and Promenade Beach, Seaside Promenade. Situated between Trichy and the coast of Tamil Nadu, Thanjavur is an important centre of South Indian religion, art, and architecture. It is also an agricultural hub, fondly known as the ‘rice bowl of Tamil Nadu’. It’s most visited monument, the Brihadeeswara Temple, is located at the centre of the city and a style of painting, called Tanjore, which is unique to the region, can be seen here. The temple forms part of the Great Living Chola Temples, which are UNESCO World Heritage Sites located in and around Thanjavur. Thousands of people still worship at the Cholas’ grand Brihadishwara Temple every day. After breakfast, drive to Thanjavur. Though the history of Thanjavur dates back to the Sangam age, it was between the 10th and 14th centuries that Thanjavur reached its zenith becoming the centre of Tamil learning and culture. Modern Thanjavur is a fertile plain. After breakfast, you’ll have a half day city tour of Thanjavur where you’ll visit the Royal Palace. The museum is popular in the town for preserving various primeval items such as the paintings, manuscripts and statues from several temples. Thereafter onwards to Brihadeeshwara temple dedicated to Shiva. Also visit the most beautiful Church in Thanjavur Schwartz Church it was built by Raja Serfoji, the last sovereign ruler of Thanjavur, in the year 1779. After this visit return to the hotel. Overnight at the hotel. The southern state of Tamil Nadu is a land of many charms, renowned for its age-old Hindu temples, elaborate Dravidian architecture, delicious Southern Indian cuisine and breath-taking scenery, among other assets. The capital, Chennai, is one of the most visited destinations in India, and the gateway to South India; the 4000-year-old city of Madurai is the location of the country’s most venerated temples – the ancient Meenakshi temple; and the union territory of Pondicherry is distinctly French in atmosphere and culture – a legacy of its colonial past. 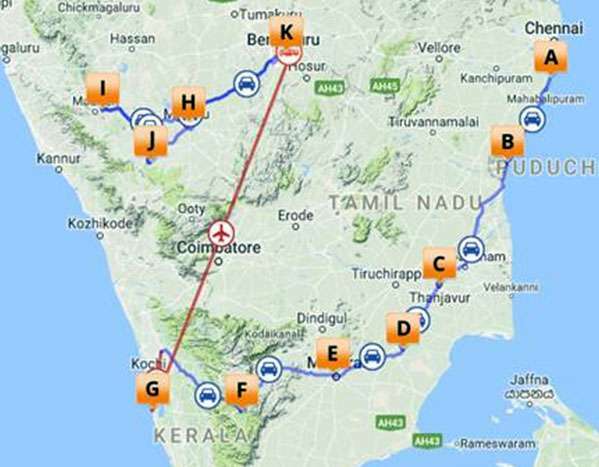 The state’s natural attractions include the Mundanthurai-Kalakad wildlife sanctuary – stretching over more than 800 square kilometres and home to rich array of wildlife, including several endangered species; the cascading waterfall of Courtallam; the Koonthankulam Bird Sanctuary; and the Pichavaram mangrove jungle – the second largest of its kind in the world. After breakfast, drive to Chettinad. 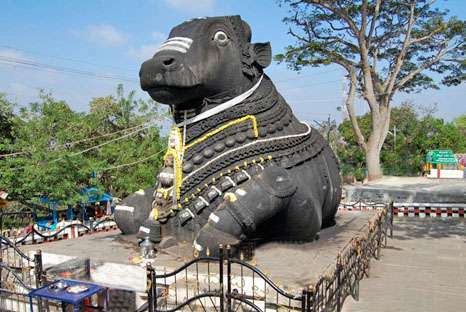 En-route visit Trichy, where you’ll visit the Rock Fort temple. It is constructed on an 83 metre (272 ft.) high rock that is said to be one of the oldest formations in the world. After visiting the temple take a walk through the bazaar and the narrow side streets, then continue drive to Chettinad. After breakfast, you will visit the huge Country Homes of the Chettiars which are embellished with marble and Burma teak and have wide courtyards and spacious rooms. Local legend says that their walls used to be polished with a paste made out of egg whites to give a smooth texture. Also visit Athangudi Village famous for handmade tiles & Old Mansion. In the evening you’ll have a traditional Bullock Cart Ride. The ride takes you through the Kanadukathan Village so you can enjoy further views of the mansions and enjoy a great rural experience. BICYCLE RIDE: Cycling with the staff of Visalam to explore the architecture and old legacy of this amazing village. INTERACTIVE KITCHEN: Chettinad is known for its culinary delicacies and food is one of the many reasons why people visit this part of India. The interactive kitchen allows guests to try their hand at cooking. Located in the southern state of Tamil Nadu, Madurai is the oldest existing city on the Indian peninsula and one of the oldest continuously inhabited cities in the world, with a recorded history spanning more than 2500 years. It is known as the ‘city of temples’ due to its countless ancient Hindu shrines, including the great Meenakshi-Sundareswar Temple, spread over 6 hectares and featuring a series of 50-metre-high gateway towers that can be seen from afar. After breakfast enjoy a Rangoli making session at the Hotel. It’s the beautiful folk art of making designs and patterns on the floor of the houses, doors, and at several other places by using several materials such as rice, coloured sand, paints and flower petals. Later you’ll drive to Madurai. Upon arrival, check in to the hotel. After a chance to wash and change you’ll visit Meenakshi temple and listen to the legend of Parvati and Shiva. Explore the local market of Madurai which is famous for tailors’ shops where you can order suits and have them ready in two hours. Later in the evening, attend the evening ceremony at Meenakshi temple during which God Siva, husband of Meenakshi would typically be carried in a palanquin from his shrine and escorted to his residing place, where Goddess Meenakshi waits in her shrine for her husband to come home. Thekkady is a district located at the Periyar National Park. Thekkady is made up of evergreen forests and savanna grass lands. This area is known for its natural spices such as black pepper, cardamom, cinnamon, nutmeg, ginger and clove. Wildlife found in this region includes elephants, tigers and sambar to name a few. After breakfast, explore the flower market full of aromas and colours. Afterwards drive to Periyar. Upon arrival check-in and freshen up. 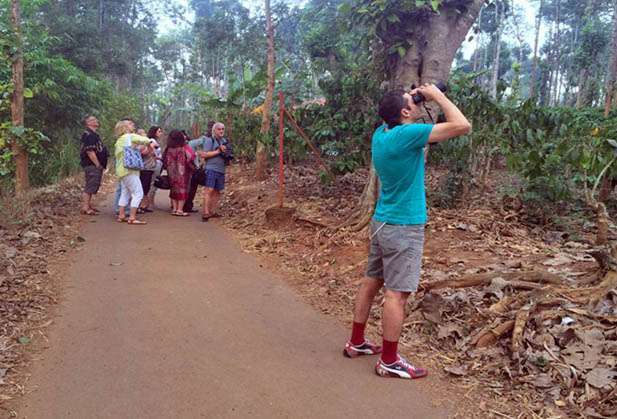 Next you’ll enjoy a Spice plantation tour: – Spices have always been an important part of life in Kerala as they play a large role in the Kerala cuisine, non-ayruvedic medicine and cosmetics. Periyar is, due to its location in the lower mountains around 1000 metres above sea level, blessed with numerous types of spices. 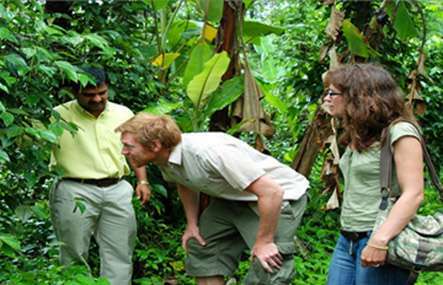 Consequently, the spice plantation tour is in one of the most important activities outside the reserve that a visitor can engage in. It is an opportunity to see why the Keralan cuisine is so different from most of the other Indian cuisines. 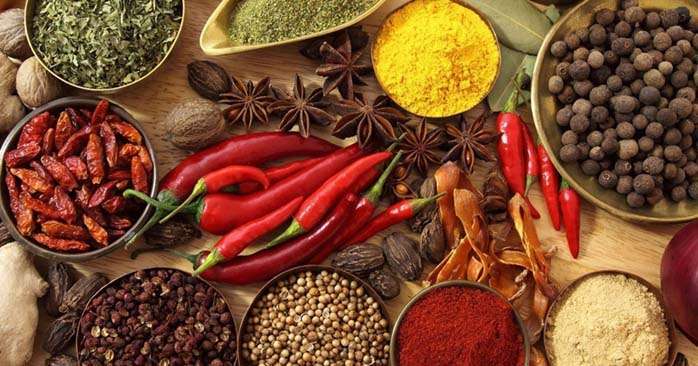 The tour gives you a chance to enjoy cardamom, pepper, clove, cinnamon, nutmeg, vanilla and many other varieties of spices and medicinal plants. Early in the morning, take a Nature walk. This is an interpretive program offering an excellent opportunity to watch birds, butterflies and other wildlife. The trails often pass through evergreen and moist deciduous forests interspersed with marshy grasslands. The program lasts for about 2-3 hours and it is the best way to experience nature, hear her whispers and smell her flowers. Return to the hotel for breakfast. Later enjoy an Elephant experience with Elephant ride, elephant bathing, and elephant feeding (around 1 hours 30 Mins) with an elephant safari through coffee, cardamom and pepper plantations. In the evening, enjoy a performance of Kalaripayattu at a local theatre. Kalaripayattu-the oldest of martial arts-is a gift to the modern world and known as the mother of all martial arts. After the show spend some time walking in the local market, famous for its fresh and pure spices. ECO ACTIVITIES: The team of resident naturalist’s will take you on a tour of the amazing eco activities that, happen at the Village – Recycling of water, solid waste management, solar energy and organic farming. You could also have a hands-on exposure of creating paper from waste. A beach village in Alappuzha, Mararikulam consists of two sections: Mararikulam North and Mararikulam South. With a tropical climate, Mararikulam attracts a large number of tourists. This village is best known for the Marari Beach which is both a popular and beautiful beach destination. After breakfast, drive to Marari. En-route board your house boat for half day cruise with lunch on board. Houseboats take you back to an era when large barges or kettuvallams laden with rice, spices and coir plied through the canals of Alleppey. These barges also carried provisions, through the rivers, lakes and streams to the houses on the riverbanks. Today these barges have been converted into luxury houseboats that afford the traveller an authentic experience of life on the backwaters. After your cruise, the vehicle will pick you up from the jetty point in Alleppey and drop at your hotel in Marari. Upon arrival, check in to the hotel. Overnight at the hotel. YOGA: Every morning at 07:00 AM. MEDITATION: Every evening at 05.15 PM. INTERACTIVE COOKING: Every evening at 06:30 PM along with the Chef. After breakfast relaxing day at the beach. You might also elect to pay for your own Ayurveda treatment whilst at the resort. Overnight at hotel. Serving as the capital of the Kingdom of Mysore from 1399 until 1947, the city of Mysore is a rich cultural and historical centre renowned for its beautiful Hindu palaces. 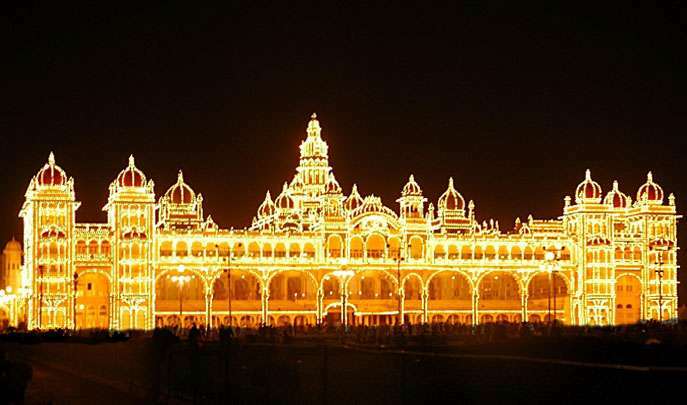 Arguably the most captivating of these is the opulent Mysore Palace or Amba Vilas, particularly during the annual Dasara Festival, when every day after sunset it turns incandescent with the light of nearly 100 000 bulbs. In the modern context, Mysore is considered one of India’s cleanest and most efficiently planned cities, and has earned a reputation for its high quality sandalwood and silk. 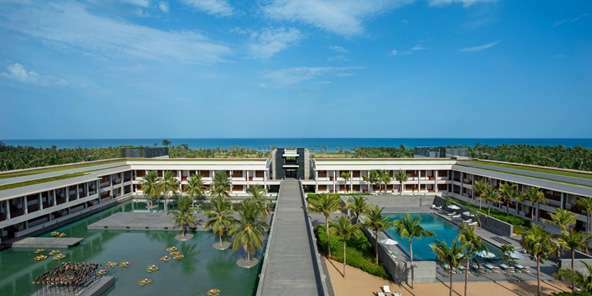 After breakfast, check out from hotel and drive to Cochin airport. On arrival, you will be provided with assisted departure transfer to the airport to connect with the flight for Bangalore. On arrival in Bangalore, you will be provided with assistance at the airport, followed by a drive to Mysore. Rest of the day is free for individual leisure activities or explore the local markets. Dinner and overnight at the resort. After your tour, return to the hotel. Overnight at the resort. 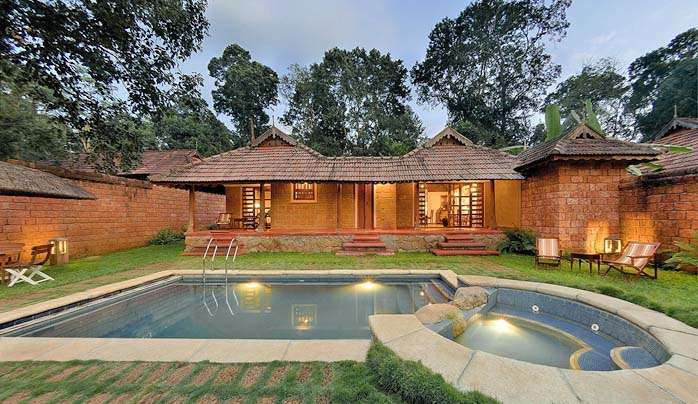 Resting in the spectacularly scenic Western Ghats of south-western Karnataka, Coorg is a historically significant hill station and a well-loved tourist destination. Coorg is undoubtedly one of Mother Nature’s darlings with its remarkably scenic landscape comprised of lush undulating hills, breath-taking waterfalls, and verdant valleys, innumerable streams, dense forests, and endless spice farms. This enchanting natural environment provides plenty of opportunities for outdoor activities including: some interesting treks up to Pushpagiri, Tadiandamol and Brahmagiri Peaks; angling in the mighty Kaveri River; and excellent golfing at one of Coorg’s world-class golf courses. Aside from Coorg’s natural splendour, the hill station also boasts some great shopping at Kushal Nagar Market and the Friday Market. Coorg with its exceptionally beautiful surroundings is a delight to visit any time of the year – an essential addition to any Karnataka itinerary. In the evening enjoy Cultural Show: Karnataka Folk Dances. Dinner and Overnight at the resort. Early morning at 7:30 to 9:00am you can enjoy a village walk or village visit by cycle In the afternoon you can have optional Ayurveda massages on direct payment basis or simply enjoy the hotel amenities. Afternoon have lunch at the resort and later travel to Kushal Nagar, where your visit includes a visit to the Tibetan Golden Temple. 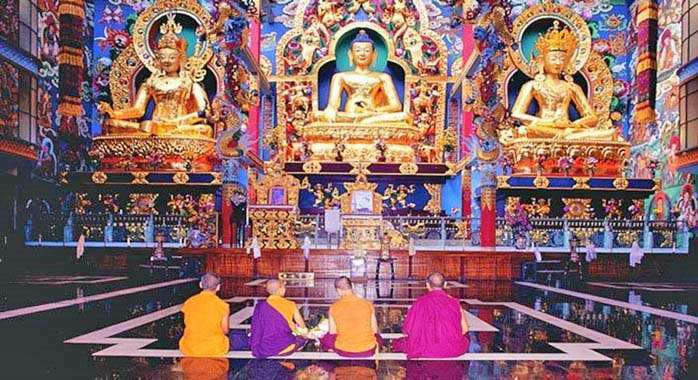 Tibetan Golden Temple is constructed more than 50 years ago when Tibetans came to India, honoured by Mahatma Gandhi. One of the Tibetan Settlements is located in Bylukoppe of Mysore District and border of Coorg District. They built many Temples to Buddha in great traditional style. Thousands of Lamas praying in the temples is seen as one of the best tourist attractions. After this visit, return to the resort. 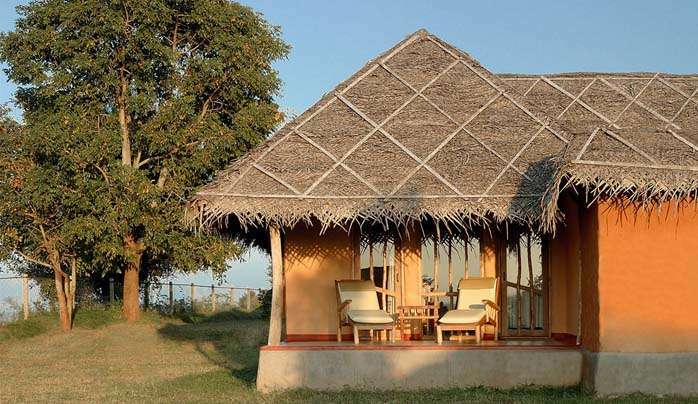 Resting on the banks of the mighty River Kabini, the Kabini Forest Reserve (or the Kabini Wildlife Sanctuary) is a vast expanse of unspoiled wilderness comprised of forestland, water-bodies and steep fertile valleys. This extraordinary reserve forms the south-eastern section of the Nagarhole National Park and is home to the world’s largest population of Asiatic elephants (estimated at around 6,000). 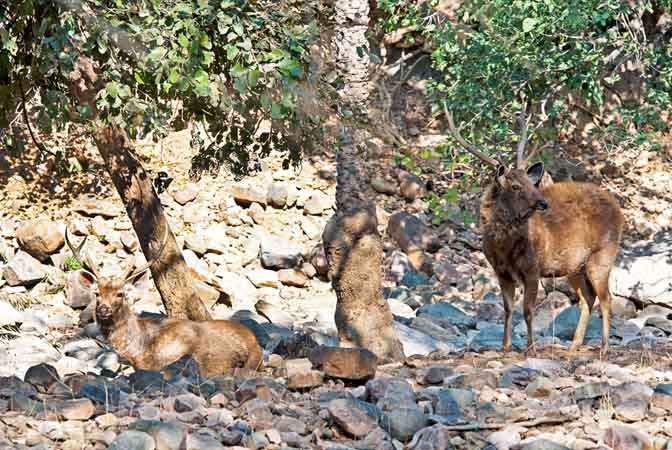 In addition to the impressive number of elephant, visitors are likely to spot a number of endangered and rare animal species including, among others: leopard, tiger, sambhar, spotted deer, python, sloth bear, cheetal, crocodile, and over 250 species of bird. Return to the resort for Breakfast. After Breakfast, commence your drive to Kabini. Kabini: The name Kabini comes from the River Kabini. The park has rich forest cover, small streams, valleys, and waterfalls. The park has a healthy tiger-predator ratio. Indian bison and elephant are much more populous. Afternoon have lunch at the resort. • Evening enjoy sunset cruise 5:45 PM till 6:15 Pm (subject to weather condition & water level in river). In the evening enjoy Documentary of wildlife: films of Indian wildlife by eminent film makers will be shown every alternative evening thus enhancing your knowledge of wildlife. Dinner and Overnight at the resort. Wake up early in the morning, have tea and snacks in the restaurant and then transfer by boat (sharing basis) to cross the river and be dropped at the Park entrance gate. • Morning enjoy Park ride by Canter / Jeep on a shared basis to see the flora and fauna of the forest and amazing wildlife. If you’re lucky you’ll perhaps see Leopard. After your safari return to the hotel by the same method. Afternoon Boat Safari: on a sharing basis: On the Boat Safari, you will be taken upstream from the resort on the Kabini River. 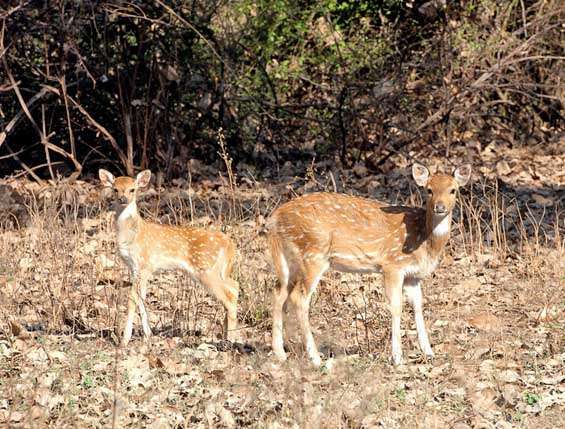 You will get an opportunity to visit the Bandipur National Park. While the animals and birds will be the same as during the vehicle safari, the boat safari offers an opportunity to observe the Marsh Crocodile and other water birds, rarely seen during the Vehicle safari. 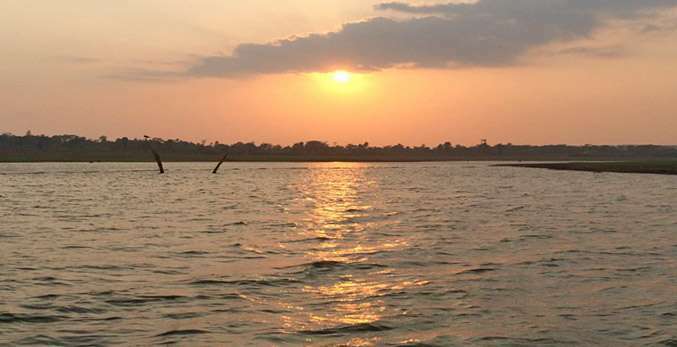 The boat safari also goes to certain areas, which are not accessible by vehicle .The backwaters of the Kabini act as a huge water body, attracting a wide variety of water birds. After your safari, return to your hotel. At 7:30 enjoy a tribal dance: On every alternate evening a cultural program takes place when a troupe of kuruba tribal dancers will be perform their traditional dance to the accompaniment of two wooden drums and one wind instrument. It is an invocation to the gods to join them and bless the occasion. Wake up early again and after tea and snacks transfer by boat a cross the river to drop at the Park entrance gate. After your safari return to the hotel by the same way for breakfast. After Lunch, check out and commence drive to Bangalore. On arrival you will be provided with your departure transfer to the international airport to connect with your homeward flight.